Know what fits really well in 36" dog crates? Crib bedding. 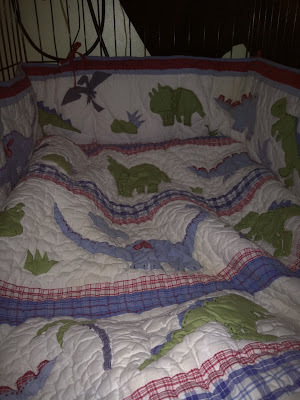 I have a variety of baby and toddler quilts that make fantastic crate bedding, they are very easy to wash and dry, and and can be layered for plenty of padding. Baby bedding is super easy to find at thrift shops and garage sales, and I don't think I've paid more than $3 for any of mine. bumper. I had thought I would have to modify it a bit to use in a dog crate, but it had enough ties to secure it nicely in Brisbane's lair. I tied it in place all around the sides and just used scissors to chop off the excess and now Briz has the most adorable dinosaur-themed crate ever. I could probably finish the raw edge on my sewing machine, but for now it looks fine. Crib bumpers are super easy to find used, most thrift stores seem to have at least three or four for sale. Though they are included with many crib bedding sets, a lot of parents dump them immediately. The American Academy of Pediatrics specifically states that bumper pads should not be used due to the risks of strangulation, entrapment, and suffocation they pose to human infants. Fortunately, dogs are a lot more capable of human infants. I would not use a bumper pad in a crate for a dog that has separation anxiety or a tendency to eat non-food items. In general, I would rather be safe than sorry, so I would not use a bumper with a new dog, recent rescue, or puppy. However, for an adult dog that enjoys their crate, crib pads can be a nice cozy addition. We just moved last weekend, and Brisbane had been very unsettled. Even though he had the same crate with the same bed and the same blanket, it didn't feel like home. After I added the dinosaur bumper pad, he went right in and fell asleep immediately. I'm not sure what it is about the pad that makes him feel secure, but he definitely loves it.